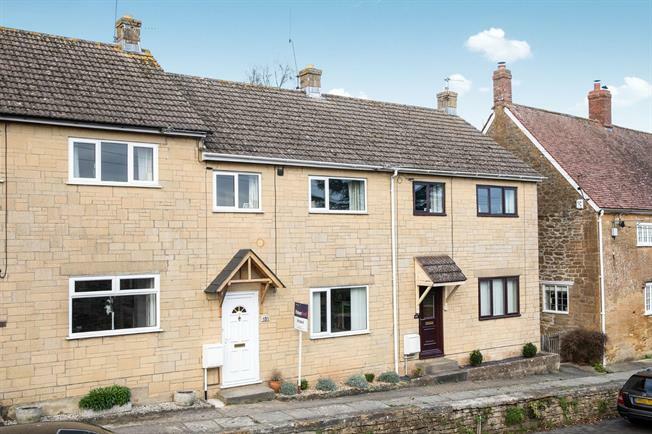 3 Bedroom Terraced House For Sale in Martock for Guide Price £195,000. Recently renovated and re-configured three bedroom property on the edge of the village. Having been the subject of much recent expenditure the property, which is arranged over two floors, comprises a dual aspect sitting room, newly fitted kitchen with oven and hob during 2018 , useful utility/cloakroom, three bedrooms and a family bathroom with newly fitted suite in 2018. Externally there is an enclosed walled and fenced garden with a covered seating area and further raked gravel seating area. The property also has a single garage. Pitched tiled canopy above the UPVC double-glazed and panelled entrance door, staircase to first floor, radiator, built in shelving cupboard. Narrowing to 2.89m. Dual aspect with uPVC double-glazed window to the front elevation and uPVC double-glazed French doors to the garden, laminate wood effect flooring, radiators, fireplace with fitted cupboards and shelving adjacent, opening to Kitchen. UPVC double-glazed window to the rear elevation overlooking the garden, newly fitted in 2018 with a comprehensive range of contemporary fronted base and wall mounted units, laminated work-surfaces, inset stainless steel sink unit and mixer tap, tiled splash-backs, inset four ring electric hob and separate electric oven, integrated refrigerator and freezer, laminated wood effect flooring, door to utility/cloakroom. Suite comprising of low-level W.C, wash-hand basin with cupboard beneath, tiled splash-backs, laminate work surface, plumbing for washing machine. 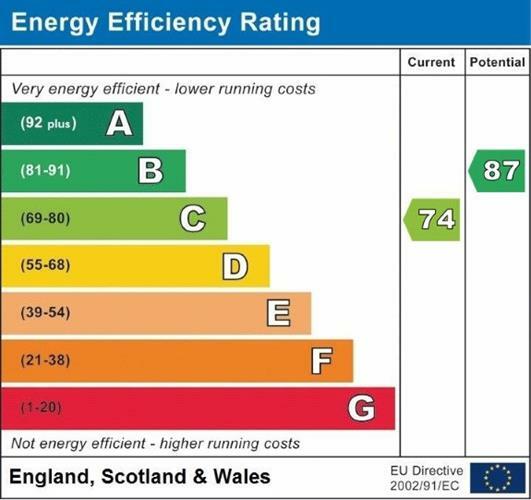 UPVC double-glazed window to the rear elevation, radiator. UPVC double-glazed window to the front elevation, radiator, coved ceiling, access to loft space. UPVC double-glazed window to the rear elevation, suite, newly fitted suite in 2018, comprising deep panelled bath with mixer shower, low-level W.C, wash hand basin, cubical with shower, ladder style heated towel rail/radiator, tiled walls, cupboard housing a recently installed gas fired central heating boiler. Fully enclosed by stone wall and fencing, gated pedestrian rear access, lawned area, patio area with steps to the lawn, covered area, rockery, trees and shrub borders. Single-size garage in a near by block with up and over door.